There really isn't anything about the C-26 that hasn't already been said, but I'll try anyways. There are numerous threads on all the major forums, writeups on other blogs and various fan sites. However, with all of that none of that beats actually seeing one in person, and a real one at that. 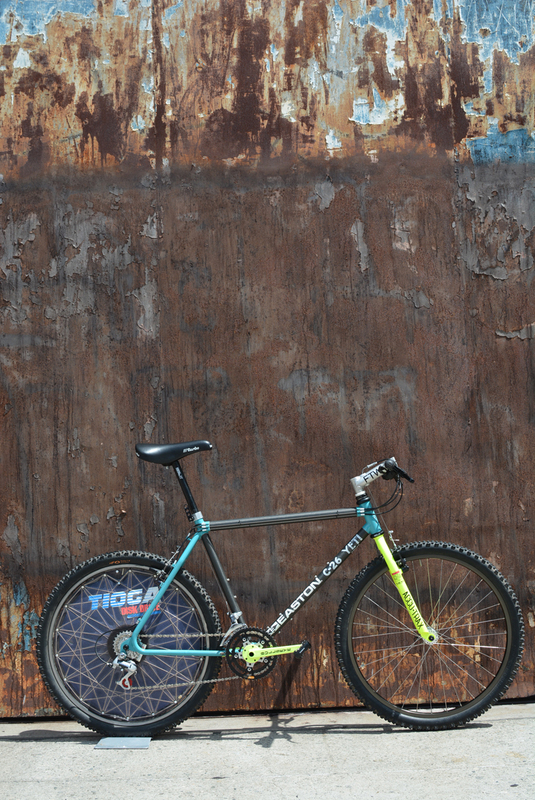 This bike is just special. It's not just rare, expensive or exotic... it's all those things with an extra of dose of crazy, it's the thermonuclear equivalent to your average explosively cool bike. It's just beyond words. 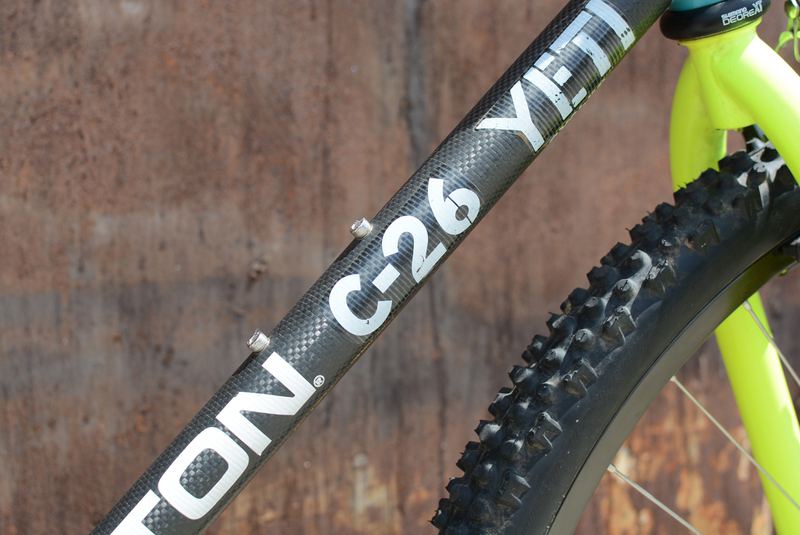 This particular C-26 is one of the original ten or so bikes built by Yeti. 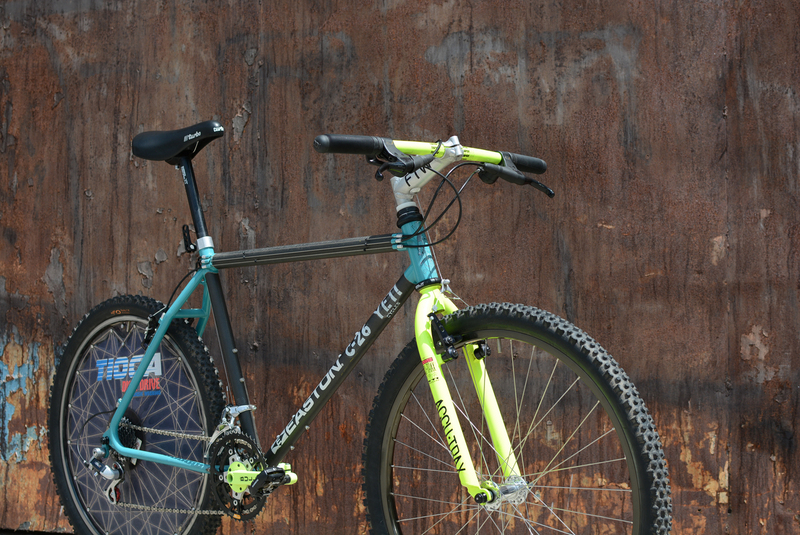 It's not a kit bike, it's not replica, it's not after hours employee project built with stolen tubes. It's the real McCoy... 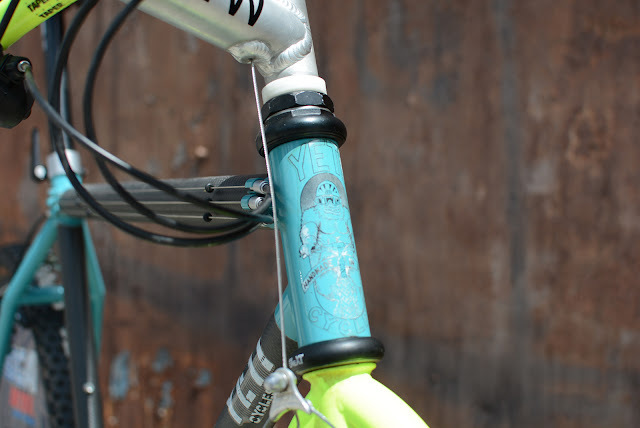 I acquired the bike earlier this year from Yeti where it hung for the past 10+ years. The history of the bike is not really known, but there are a few theories. Based on the size of the frame (19.5) Herting thought it may have been made for J Riddle who worked on marketing the Easton C9 tubing. It may have been a test or demo bike used by Yeti, eventually ending up in the 1991 catalog. The latter theory is supported by the fact that it's seen some heavy use and has identical features to the 91 catalog bike. Regardless of its past the bike is iconic and I'm just glad I had the opportunity to put it back together and preserve it for the future. 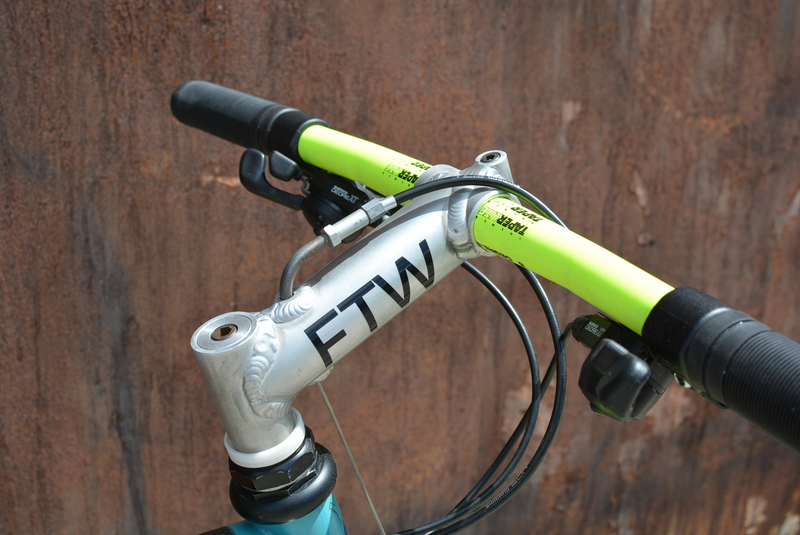 I was going to go with a dayglo ATAC stem, but an an Aluminum FTW stem feels so much better here. 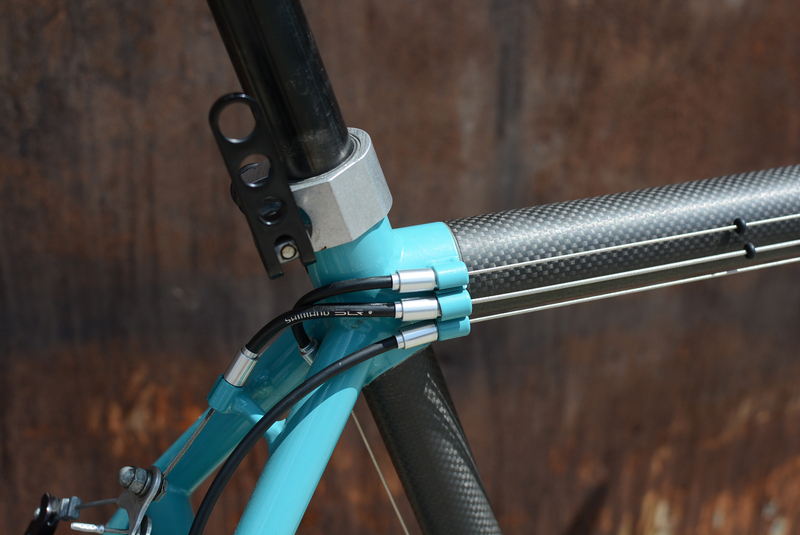 This particular stem was made by Frank this year and is not a vintage one, but I'm willing to accept that. I know where a couple old stems are and maybe some day I can pry one away from the owners. 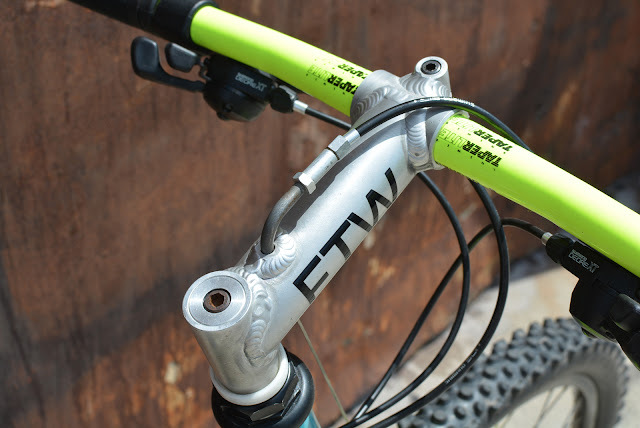 The FTW stem is really a work of art, I'd love to see how it feels on the trail but sadly this bike is not really suitable to ride... so I'll just have to imagine. Dayglo Answer Taperlite bar and Shimano M092 brifters complete the cockpit. 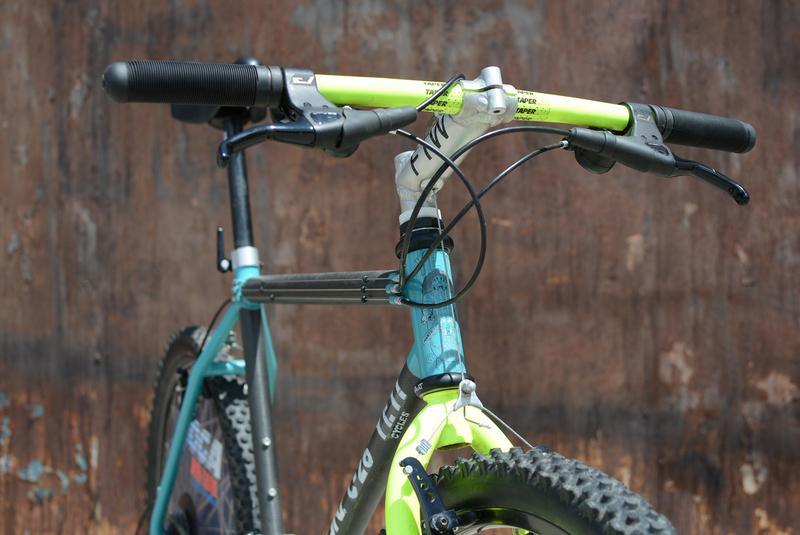 Original dayglo Accutrax fork, Grafton Speedcontrollers and Onza Porcupine tires are always right at home when it comes to Yetis. The only number that counts when talking about Yetis!!! Vintage Tioga Tension Disk Drive built at St. Henri shop in Malibu. 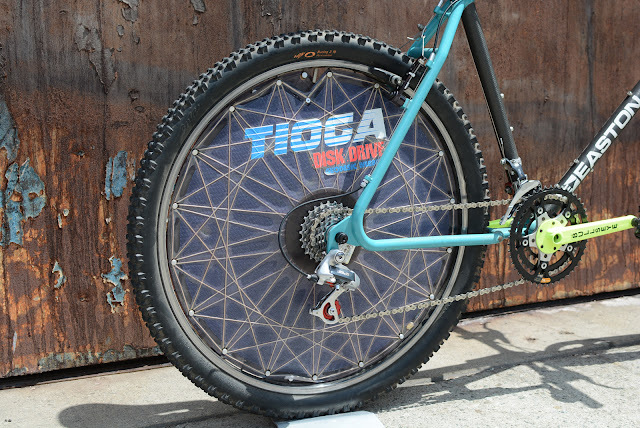 This Disk Drive and the Bullseye cranks are actually ex Yeti kit I got from Herting several years ago, feels good to put them on a deserving bike. 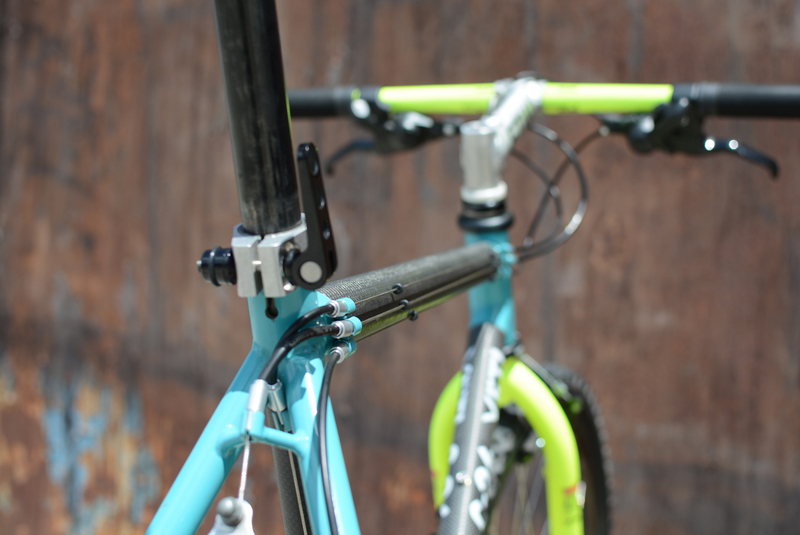 Notice the rear derailleur cable stop. This is one of only a few C-26 to have this old style stop which enables the use of a an adjustable barrel for the rear derailleur cable housing. This was typical on the early Simplex dropout FROs and the first few C-26s. 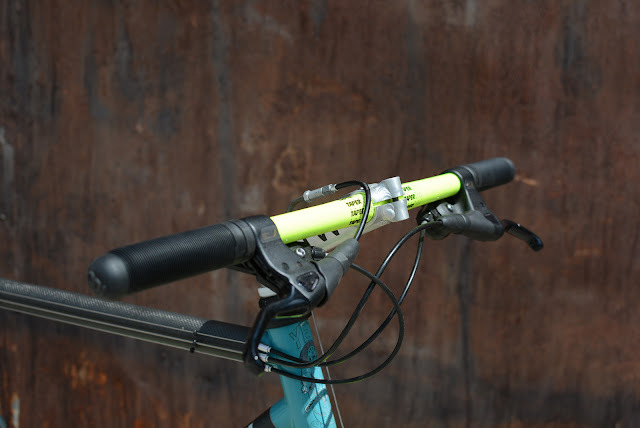 All of the later bikes, including Juli and Johns had the more commonly seen slotted cable stop. 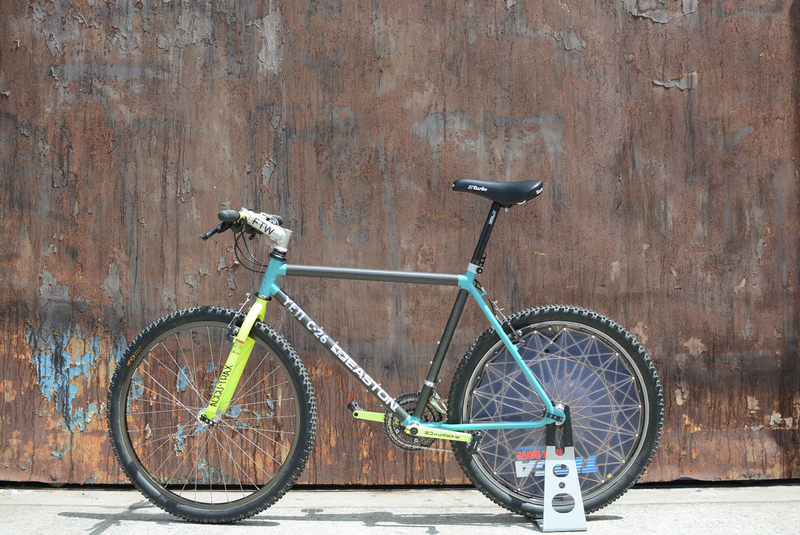 This bike has the mix of the later style dropouts and this stop, which is also what the bike in the 91 catalog had, making me think that this is the bike. 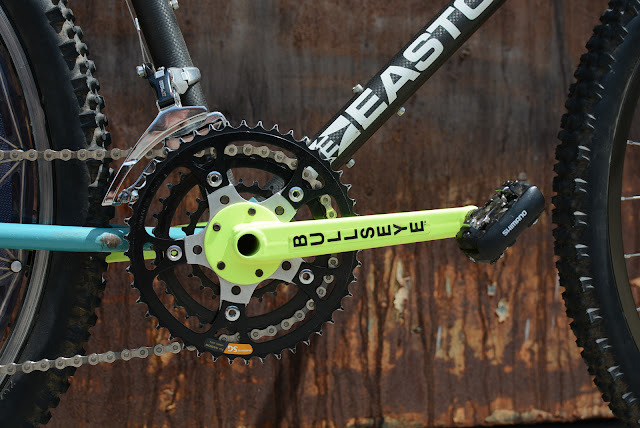 Original Yeti team yellow Bullseye cranks came from non other than Chris Hertings personal stash. I chose the XT brifters (push-push shifters) in lieu of the more commonly used thumbies because this was meant to be a race bike and by the time 91 rolled along (when this bike 'I think' was used for the Yeti catalog) most pro racers were running that style of shifters. 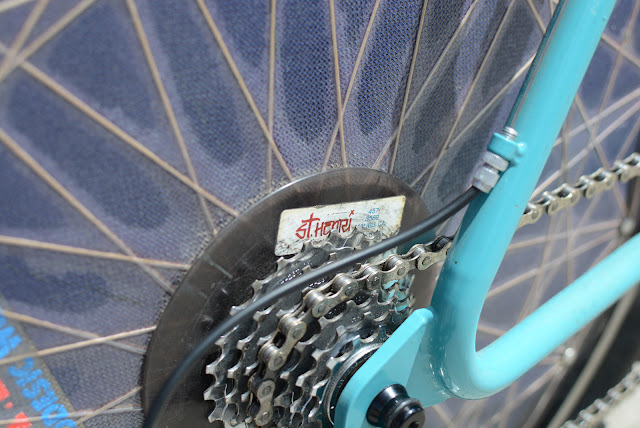 One way to spot an original C-26 is the 2nd generation Yetiman headtube badge. 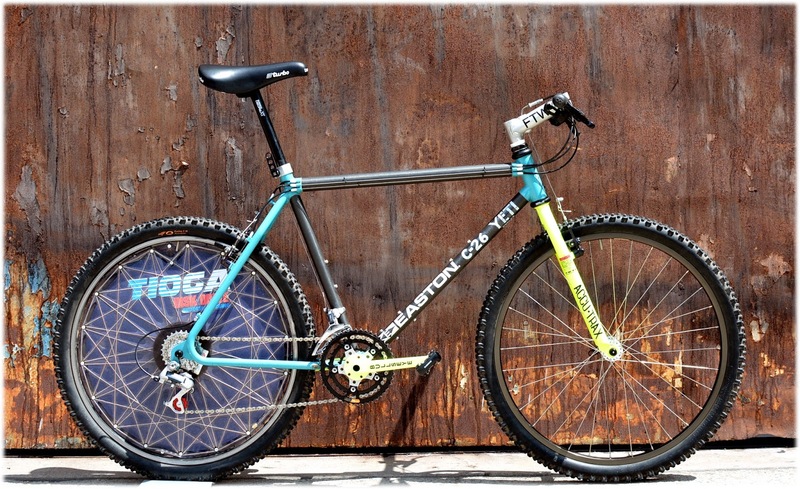 Most of the kit and after-hours bikes had the 3rd generation sliding Yetiman. 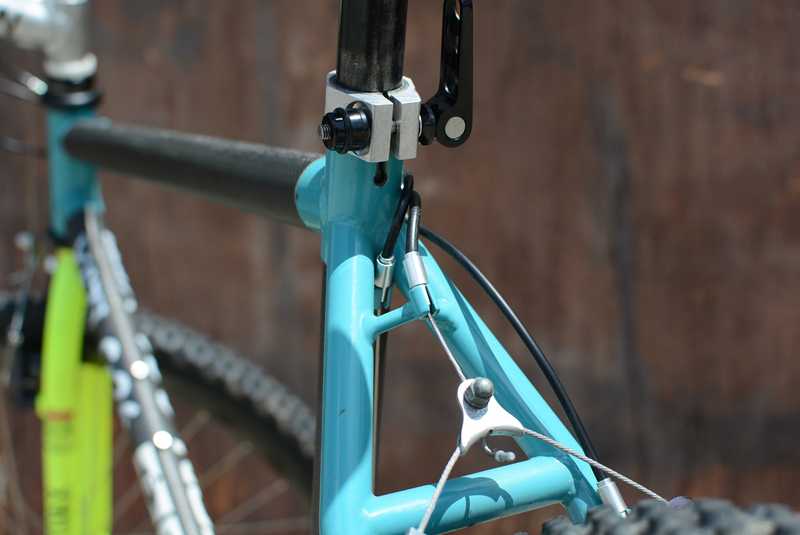 Another sign of an original C-26 is the lack of a reinforcing gusset on the chainstay side of the wishbone. All of the later kit bikes had these. Early pulleys were made by turning down Bullseye derailleur pulleys all of which were red. 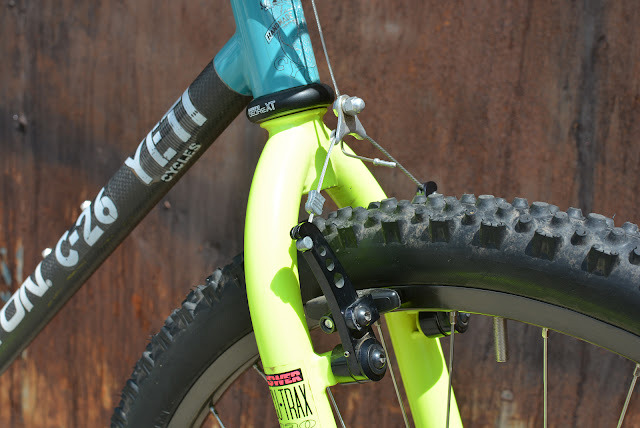 The later bikes (ARCs, etc) had pulleys that were custom made for Yeti and available in a myriad of colors to match the kit. One unfortunate bit about the bike is the fact that the seat tube has come unglued from the bottom bracket shell rendering the bike unrideable. I plan on sending to Chris Herting in an effort to repair it, but even if he's successful I doubt I'll ever be able to really ride it on anything other than a gentle trail if that. In the end this seems hardly surprising as these were built to be race bikes that were probably only expected to last several races and then hit the scrap pile. Tomac had three frames on top of a couple all steel FROs for barely one season. Juli only got her's for the worlds in 1990... so they were never meant to last this long. 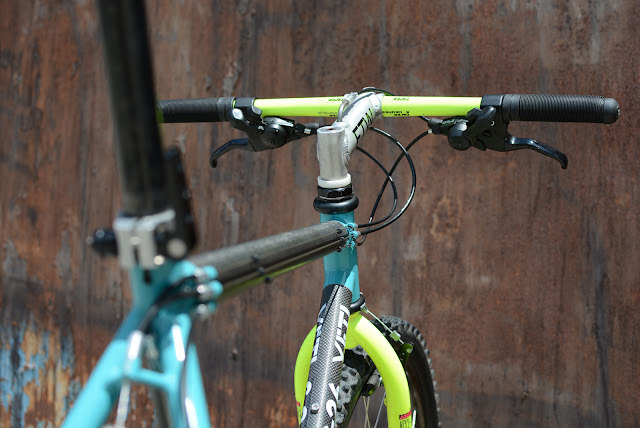 The seat cluster on these bikes is really cool. 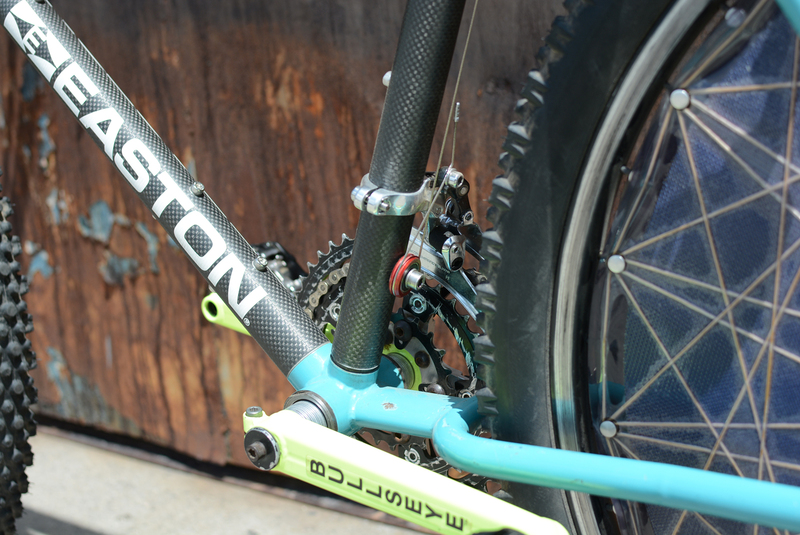 Some of the team bikes lacked this stop in between the seat stays and had a riveted on stop lower down on the seat tube. Most of the kit bikes had a stop similar to this, while the after-hours bikes were had clamp on stops for the front derailleur. 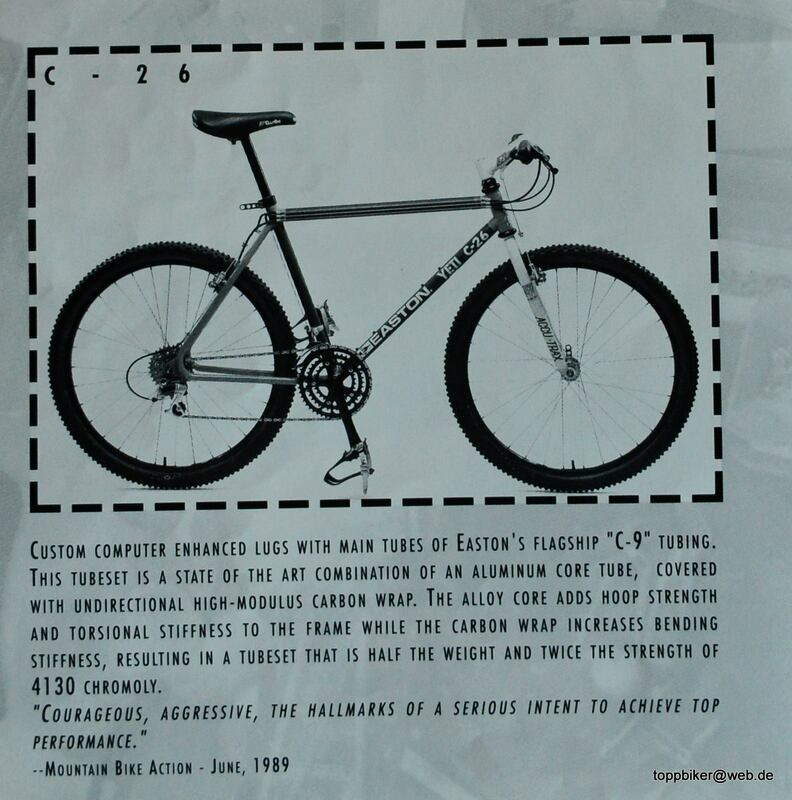 Unlike nearly all of the early Yetis which had a 26.8m seatpost, the C-26 has a 27.0-27.2 seatpost which required a custom seat clamp to go over the larger seat tube. I was lucky enough to source an original one which is bored out to fit the C-26. I should have used a Chris King headset, easy enough fix. Regardless of whether or not I'll ever actually ride this bike it's really good enough to just be able to work on it or bring it to an event or two. For me the C-26 is the equivalent of the pre war Auto Union race cars, so few were built, the all created history and then were lost to time. Only now have a few surfaced and been restored to their former glory for all to see. That's how I feel about this bike. It's racing days may be over, but it can still represent an age where performance pushed the boundaries of reason. As Chris Herting famously said about putting John Tomac on the C-26 for the 1990 worlds, "Tomac was worth a million bucks and we could have killed him", that about sums it about!